We Mean Business > 36 D I V E R S I T Y W O M A N Fa l l 2 0 1 7 d i v e r s i t y w o m a n . c o m REASON #5: To better manage your time, talents, and resources. Nearly 15 years ago, Harris's mother died of colon cancer. "I think a lot that had to do with her taking on the persona of Su- perwoman," she says. "As an older mom to a five-year-old, I want to be here a little bit longer, so I shifted my priorities." Harris travels once or twice a month to see clients. To better manage her work- flow, she started prioritizing and letting the perfectionism go. "I ask what my re- sponsibility is, meet my time lines, and hit my targets," she says. She has also gotten a lot more organized and manages her team better. As a result of her stellar efforts, she I n January 2016, I started working with a life coach. I'll admit it: I was scared be- cause it meant I had to finally articulate what I wanted next in my life and actually do something about it. I've always wanted to own a media company as a writer, edi- tor, and content strategist. But I was completely overwhelmed by my disorganization, lack of an advisory team—lawyer, accountant, business advisor, banker—and experience in the multistep process of setting up shop. 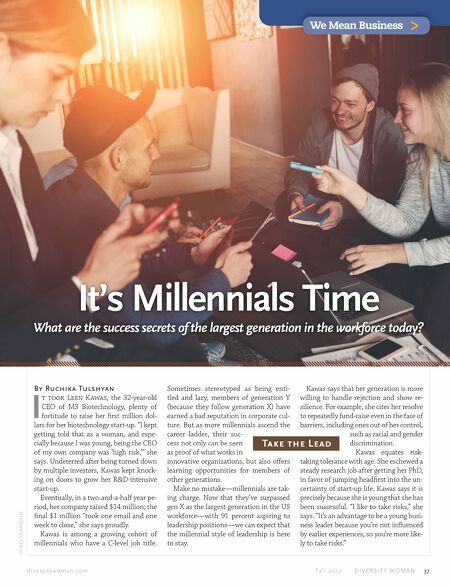 As a writer and editor specializing in finance, careers, and small-business content, I was always irked that I knew better, but I couldn't quite take the initiative. I'm driven by nature, so once my coach and I partnered, I was off and running. A lot of the work has been introspective. Answering questions—What do you envision for yourself? How do you want to serve? Who do you want to help? How much do you want to earn?—allowed me to be specific about my goals. 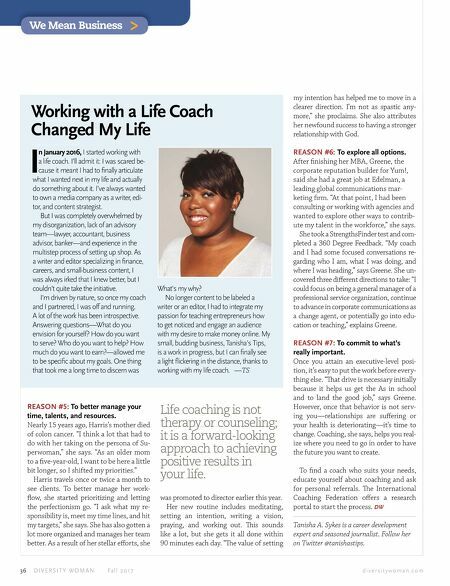 One thing that took me a long time to discern was Working with a Life Coach Changed My Life was promoted to director earlier this year. Her new routine includes meditating, setting an intention, writing a vision, praying, and working out. is sounds like a lot, but she gets it all done within 90 minutes each day. "e value of setting my intention has helped me to move in a clearer direction. I'm not as spastic any- more," she proclaims. She also attributes her newfound success to having a stronger relationship with God. REASON #6: To explore all options. After finishing her MBA, Greene, the corporate reputation builder for Yum!, said she had a great job at Edelman, a leading global communications mar- keting firm. "At that point, I had been consulting or working with agencies and wanted to explore other ways to contrib- ute my talent in the workforce," she says. She took a StrengthsFinder test and com- pleted a 360 Degree Feedback. "My coach and I had some focused conversations re- garding who I am, what I was doing, and where I was heading," says Greene. She un- covered three different directions to take: "I could focus on being a general manager of a professional service organization, continue to advance in corporate communications as a change agent, or potentially go into edu- cation or teaching," explains Greene. REASON #7: To commit to what's really important. Once you attain an executive-level posi- tion, it's easy to put the work before every- thing else. "at drive is necessary initially because it helps us get the As in school and to land the good job," says Greene. However, once that behavior is not serv- ing you—relationships are suffering or your health is deteriorating—it's time to change. Coaching, she says, helps you real- ize where you need to go in order to have the future you want to create. To find a coach who suits your needs, educate yourself about coaching and ask for personal referrals. e International Coaching Federation offers a research portal to start the process. DW Tanisha A. Sykes is a career development expert and seasoned journalist. Follow her on Twitter @tanishastips. What's my why? No longer content to be labeled a writer or an editor, I had to integrate my passion for teaching entrepreneurs how to get noticed and engage an audience with my desire to make money online. My small, budding business, Tanisha's Tips, is a work in progress, but I can finally see a light flickering in the distance, thanks to working with my life coach. —TS Life coaching is not therapy or counseling; it is a forward-looking approach to achieving positive results in your life.